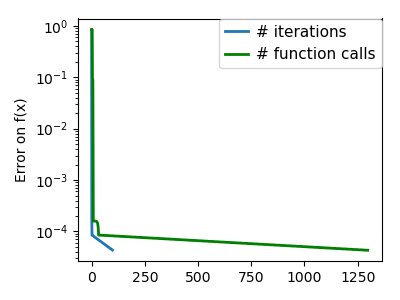 Mathematical optimization deals with the problem of finding numerically minimums (or maximums or zeros) of a function. 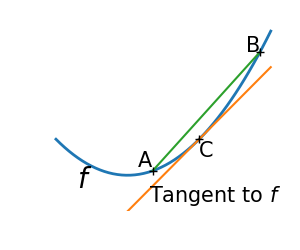 In this context, the function is called cost function, or objective function, or energy. 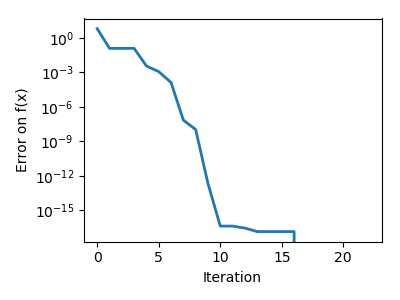 Here, we are interested in using scipy.optimize for black-box optimization: we do not rely on the mathematical expression of the function that we are optimizing. Note that this expression can often be used for more efficient, non black-box, optimization. 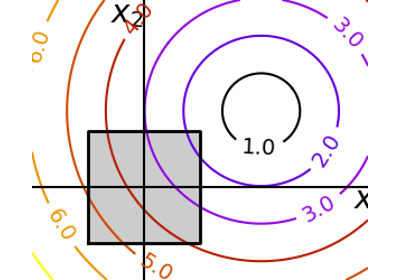 Convex Optimization by Boyd and Vandenberghe (pdf available free online). 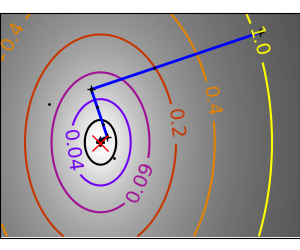 Numerical Optimization, by Nocedal and Wright. 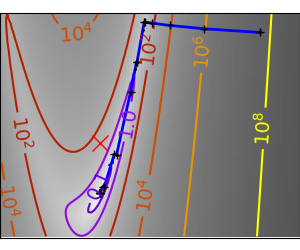 Detailed reference on gradient descent methods. 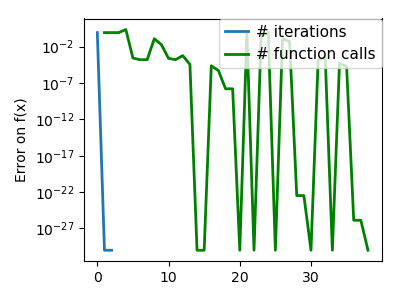 Practical Methods of Optimization by Fletcher: good at hand-waving explanations. Not all optimization problems are equal. Knowing your problem enables you to choose the right tool. 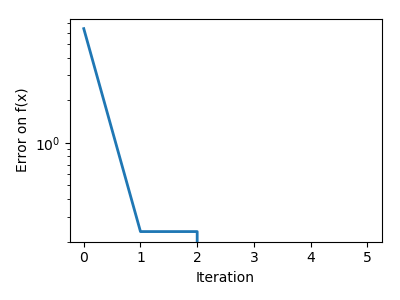 The scale of an optimization problem is pretty much set by the dimensionality of the problem, i.e. 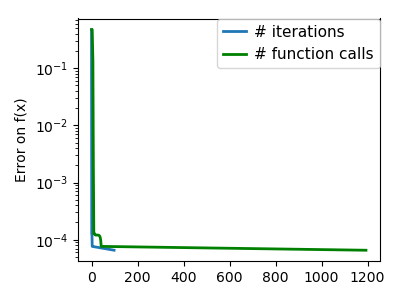 the number of scalar variables on which the search is performed. f is above all its tangents. 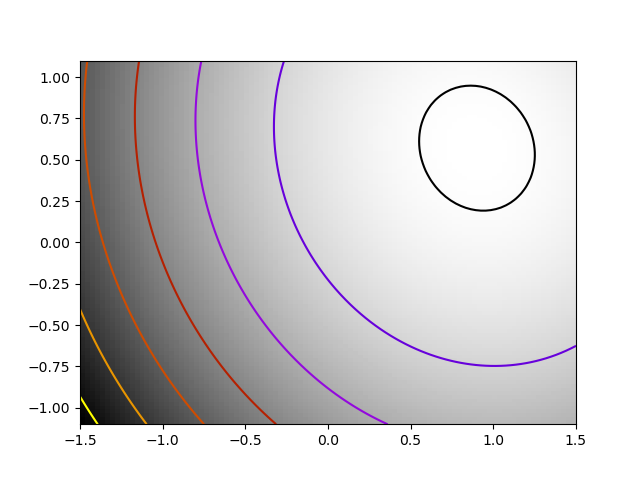 Optimizing convex functions is easy. 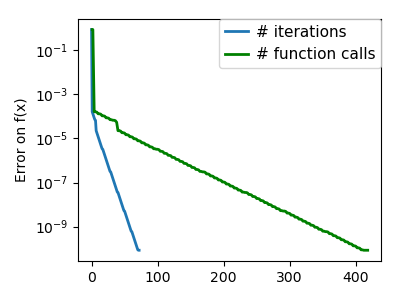 Optimizing non-convex functions can be very hard. 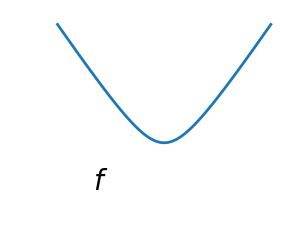 It can be proven that for a convex function a local minimum is also a global minimum. Then, in some sense, the minimum is unique. 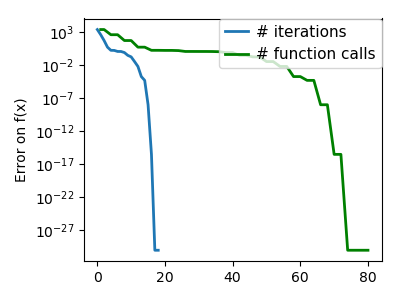 Optimizing smooth functions is easier (true in the context of black-box optimization, otherwise Linear Programming is an example of methods which deal very efficiently with piece-wise linear functions). 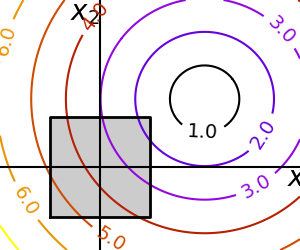 Many optimization methods rely on gradients of the objective function. 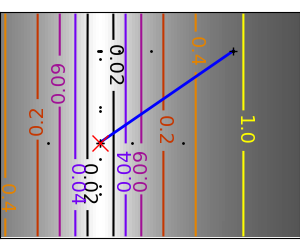 If the gradient function is not given, they are computed numerically, which induces errors. 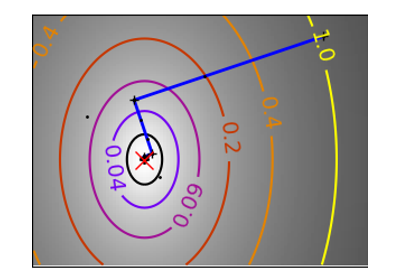 In such situation, even if the objective function is not noisy, a gradient-based optimization may be a noisy optimization. 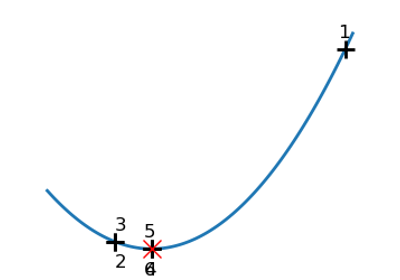 Brent’s method on a quadratic function: it converges in 3 iterations, as the quadratic approximation is then exact. 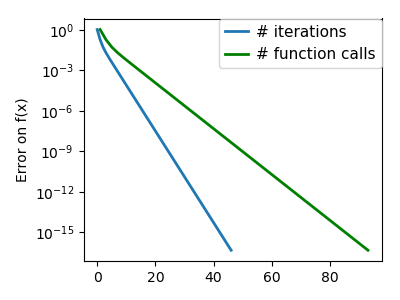 Brent’s method on a non-convex function: note that the fact that the optimizer avoided the local minimum is a matter of luck. You can use different solvers using the parameter method. 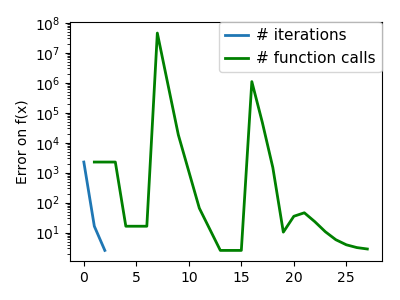 scipy.optimize.minimize_scalar() can also be used for optimization constrained to an interval using the parameter bounds. Here we focus on intuitions, not code. Code will follow. 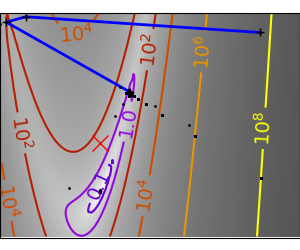 Gradient descent basically consists in taking small steps in the direction of the gradient, that is the direction of the steepest descent. 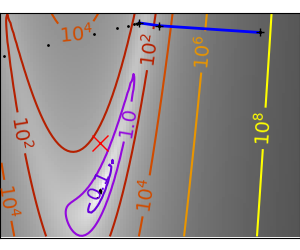 The core problem of gradient-methods on ill-conditioned problems is that the gradient tends not to point in the direction of the minimum. 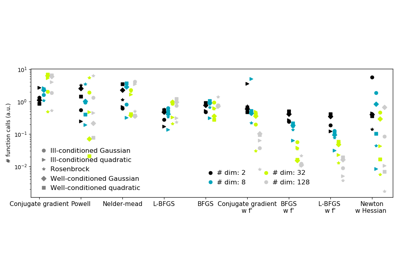 We can see that very anisotropic (ill-conditioned) functions are harder to optimize. 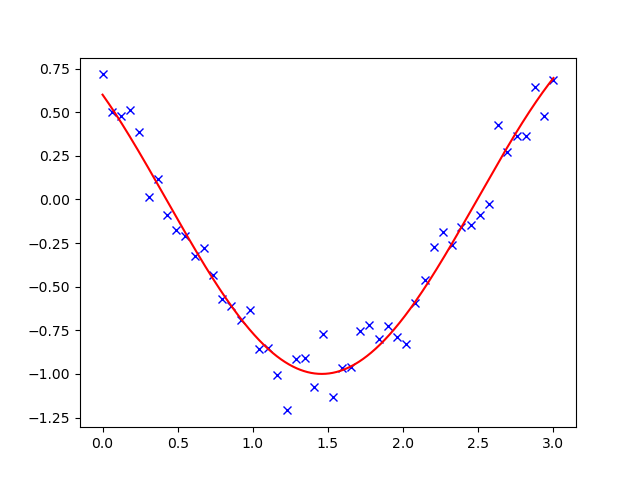 If you know natural scaling for your variables, prescale them so that they behave similarly. This is related to preconditioning. Also, it clearly can be advantageous to take bigger steps. 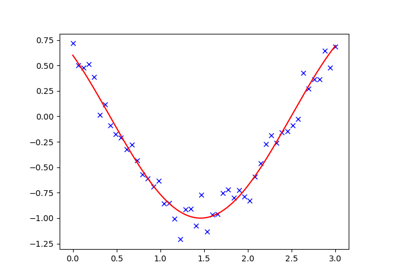 This is done in gradient descent code using a line search. 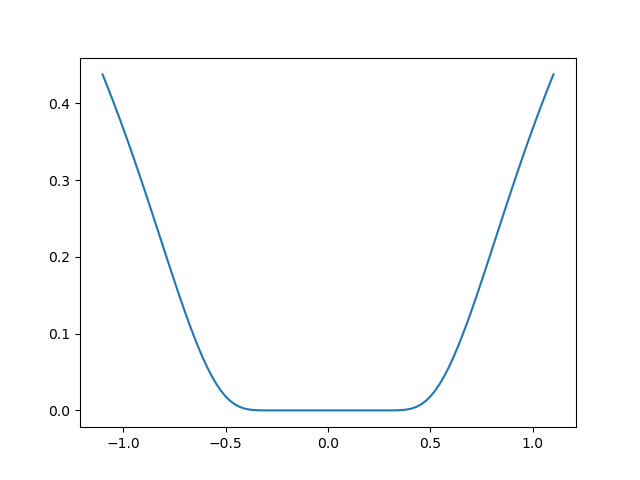 An ill-conditioned very non-quadratic function. 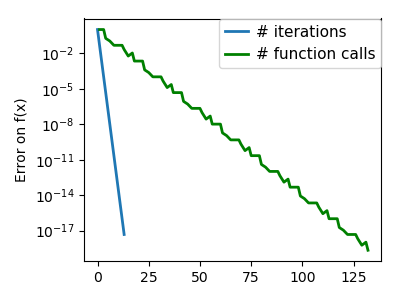 The more a function looks like a quadratic function (elliptic iso-curves), the easier it is to optimize. The gradient descent algorithms above are toys not to be used on real problems. 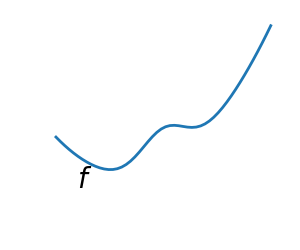 As can be seen from the above experiments, one of the problems of the simple gradient descent algorithms, is that it tends to oscillate across a valley, each time following the direction of the gradient, that makes it cross the valley. 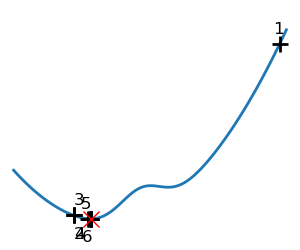 The conjugate gradient solves this problem by adding a friction term: each step depends on the two last values of the gradient and sharp turns are reduced. 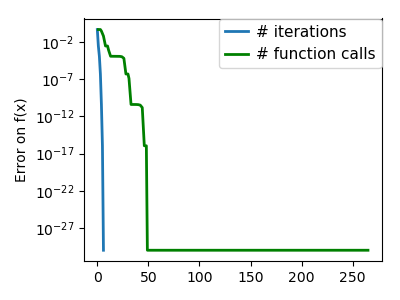 Note that the function has only been evaluated 27 times, compared to 108 without the gradient. 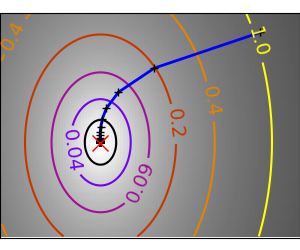 Newton methods use a local quadratic approximation to compute the jump direction. 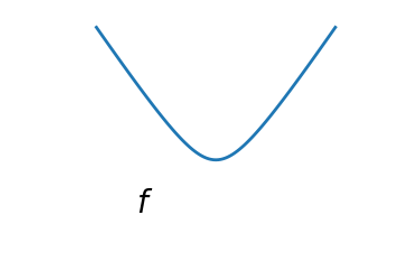 For this purpose, they rely on the 2 first derivative of the function: the gradient and the Hessian. 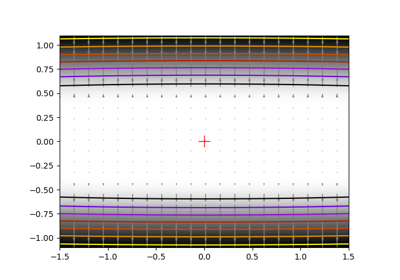 Here we are optimizing a Gaussian, which is always below its quadratic approximation. 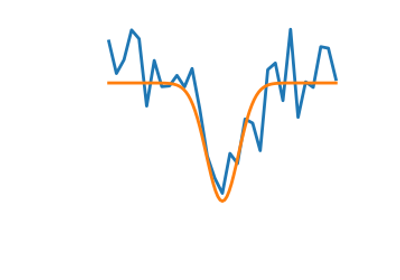 As a result, the Newton method overshoots and leads to oscillations. 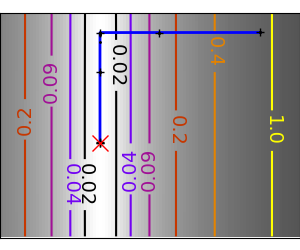 At very high-dimension, the inversion of the Hessian can be costly and unstable (large scale > 250). 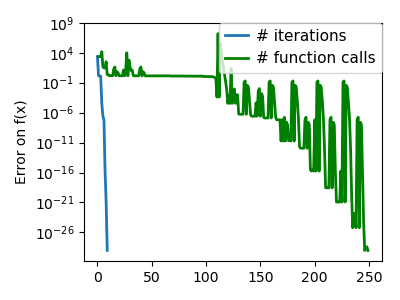 Newton optimizers should not to be confused with Newton’s root finding method, based on the same principles, scipy.optimize.newton(). 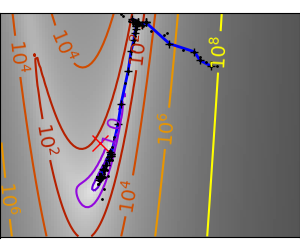 BFGS: BFGS (Broyden-Fletcher-Goldfarb-Shanno algorithm) refines at each step an approximation of the Hessian. 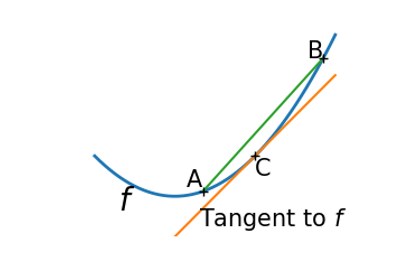 On a exactly quadratic function, BFGS is not as fast as Newton’s method, but still very fast. Here BFGS does better than Newton, as its empirical estimate of the curvature is better than that given by the Hessian. 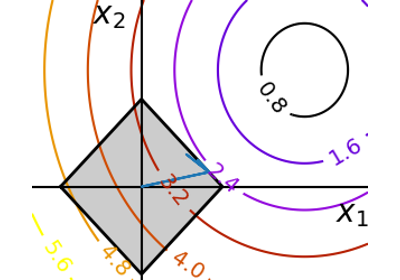 The Nelder-Mead algorithms is a generalization of dichotomy approaches to high-dimensional spaces. The algorithm works by refining a simplex, the generalization of intervals and triangles to high-dimensional spaces, to bracket the minimum. 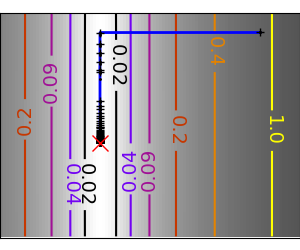 Strong points: it is robust to noise, as it does not rely on computing gradients. 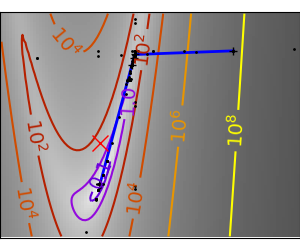 Thus it can work on functions that are not locally smooth such as experimental data points, as long as they display a large-scale bell-shape behavior. 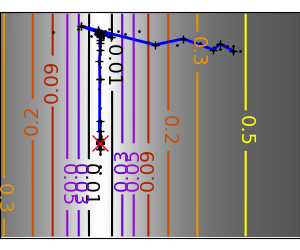 However it is slower than gradient-based methods on smooth, non-noisy functions. 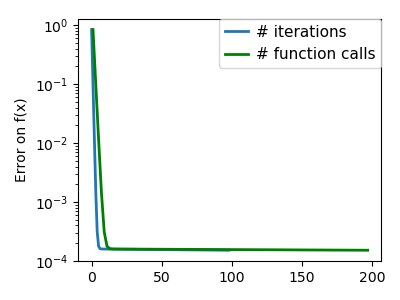 If your problem does not admit a unique local minimum (which can be hard to test unless the function is convex), and you do not have prior information to initialize the optimization close to the solution, you may need a global optimizer. 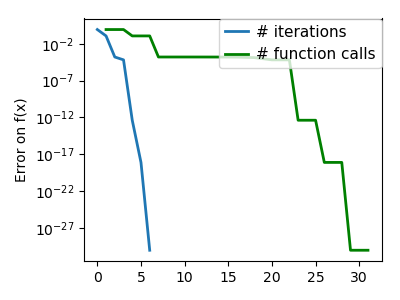 All methods are exposed as the method argument of scipy.optimize.minimize(). On well-conditioned problems, Powell and Nelder-Mead, both gradient-free methods, work well in high dimension, but they collapse for ill-conditioned problems. Computational overhead of BFGS is larger than that L-BFGS, itself larger than that of conjugate gradient. On the other side, BFGS usually needs less function evaluations than CG. 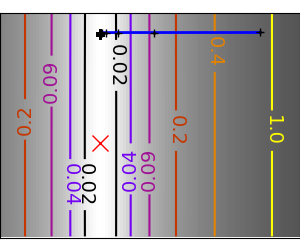 Thus conjugate gradient method is better than BFGS at optimizing computationally cheap functions. 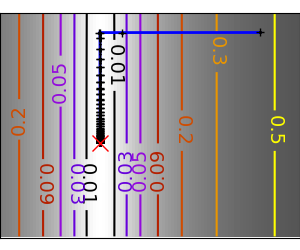 If you can compute the Hessian, prefer the Newton method (Newton-CG or TCG). 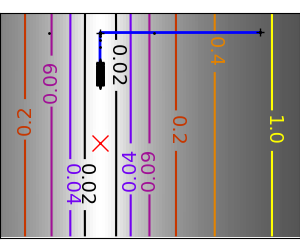 Choose the right method (see above), do compute analytically the gradient and Hessian, if you can. Choose your initialization points wisely. 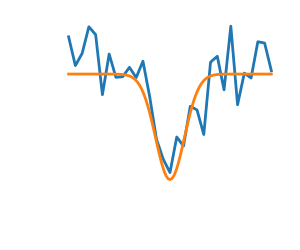 For instance, if you are running many similar optimizations, warm-restart one with the results of another. 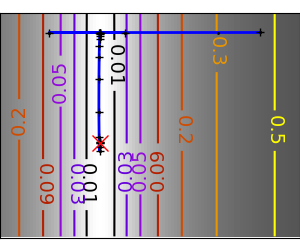 Relax the tolerance if you don’t need precision using the parameter tol. 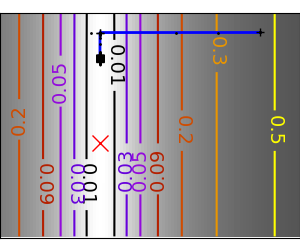 Computing gradients, and even more Hessians, is very tedious but worth the effort. Symbolic computation with Sympy may come in handy. 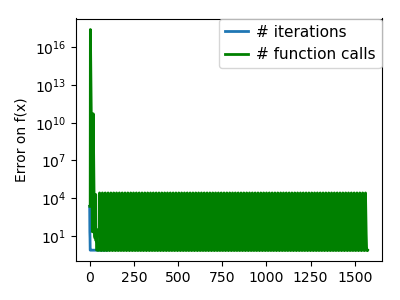 See also scipy.optimize.approx_fprime() to find your errors. Time your approach. Find the fastest approach. Why is BFGS not working well? 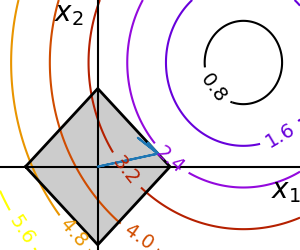 Consider the function exp(-1/(.1*x**2 + y**2) . 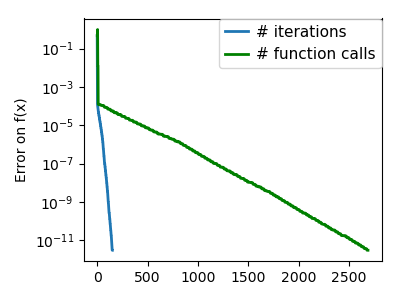 This function admits a minimum in (0, 0). 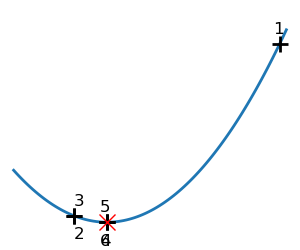 Starting from an initialization at (1, 1), try to get within 1e-8 of this minimum point. 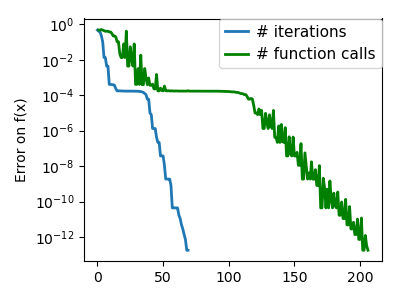 Least square problems, minimizing the norm of a vector function, have a specific structure that can be used in the Levenberg–Marquardt algorithm implemented in scipy.optimize.leastsq(). 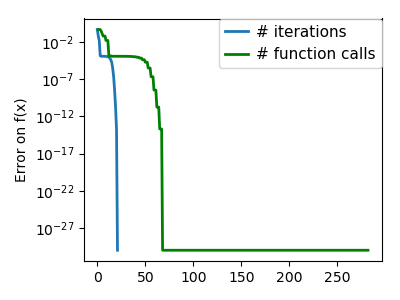 BFGS needs more function calls, and gives a less precise result. 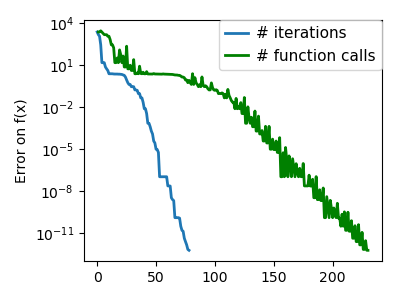 leastsq is interesting compared to BFGS only if the dimensionality of the output vector is large, and larger than the number of parameters to optimize. 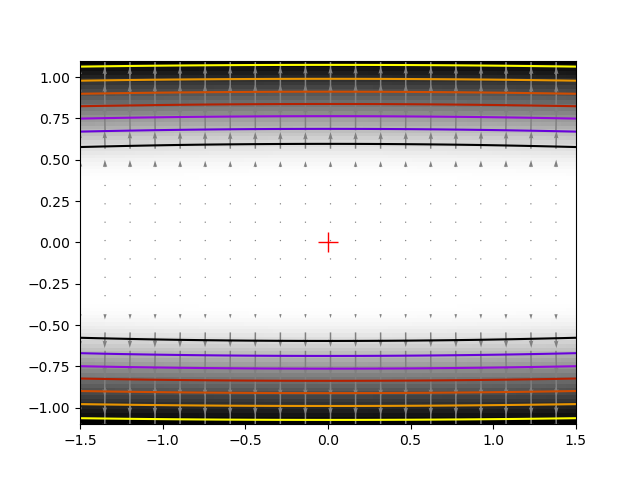 If the function is linear, this is a linear-algebra problem, and should be solved with scipy.linalg.lstsq(). Do the same with omega = 3. What is the difficulty? 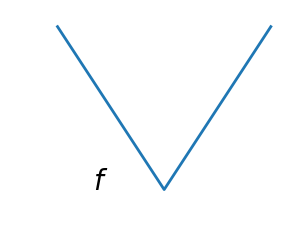 Equality and inequality constraints specified as functions: and . 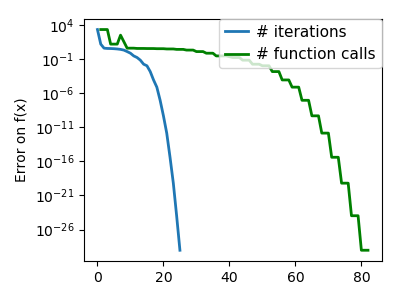 The above problem is known as the Lasso problem in statistics, and there exist very efficient solvers for it (for instance in scikit-learn). In general do not use generic solvers when specific ones exist. 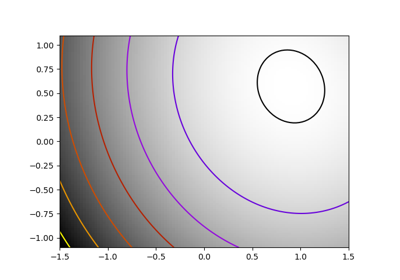 If you are ready to do a bit of math, many constrained optimization problems can be converted to non-constrained optimization problems using a mathematical trick known as Lagrange multipliers.